Tesla’s “Master Plan, Part Deux” includes a wide range of future vehicles, including a pickup, a compact SUV, and even a semi-truck. Sadly however, Tesla might be missing an important segment niche – the minivan. Sure, sales of minivans have dwindled with the exploding popularity of the crossover, but families continue to rely on the minivan’s unparalleled interior volume and downright handiness for hauling the kids and their stuff. With that in mind, we decided to render what a Tesla minivan might look like. However unlikely, the idea is an interesting one. 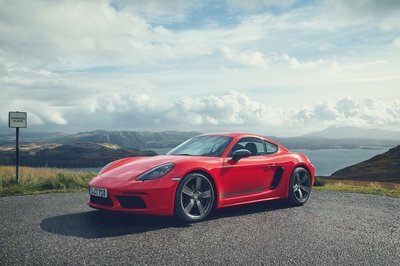 Think about it – interior volume would be nearly unimpeded thanks to the battery pack being incased in the flat floor with relatively compact electric motors at either end. Its “frunk” gives space to store items separate from the passenger cabin. And there would be no more smelly, greasy gas pumps to operate. Sounds great, right mom? 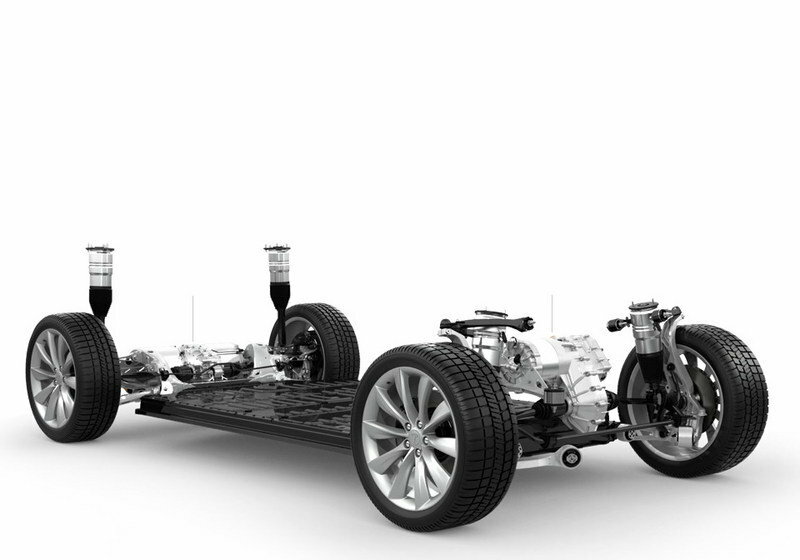 A similar chassis as the Model X SUV would likely underpin Tesla’s version of a minivan. Perhaps the wheelbase would be slightly stretched to accommodate for a larger third row and the inevitable sliding rear doors. Maybe Tesla engineers would develop some sort of hidden track system for those doors, eliminating the unsightly gap in the rear quarter panels. The potential for innovation is boundless. Let’s check out the details below. Continue reading to learn more about the Tesla Minivan. Okay, so the nose wasn’t hard to come up with. 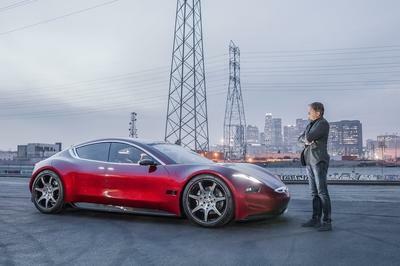 Tesla designers would surely use the corporate look to retain a connection to the automaker’s other products. Remember, by this time, Tesla will have the two sedans, an SUV, a pickup truck, a city bus, and a semi-truck. The Model X is, quite honestly, almost a minivan anyway. Swap those Falcon doors and sloping rear roof for something a bit more family friendly, and boom – a minivan. That’s the idea here. 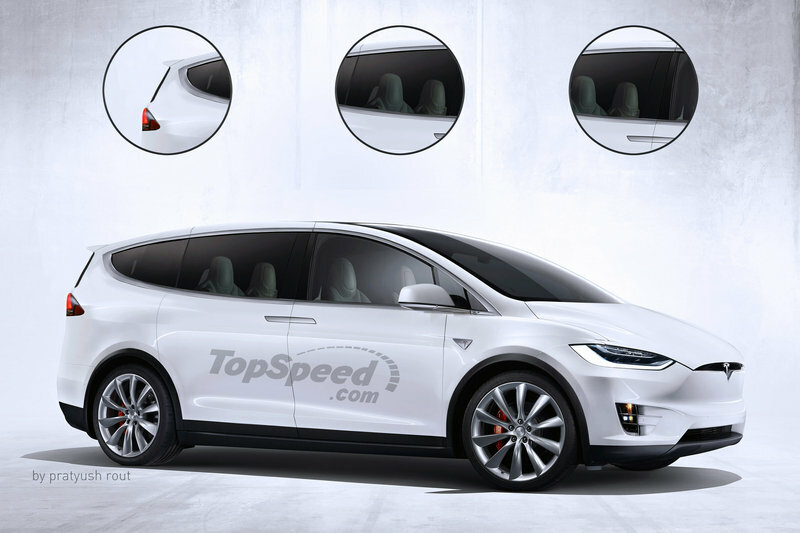 There are several major design changes our rendering shows between the Model X and the minivan. Up front, the position of the A-pillars are slid forward, maximizing the passenger compartment and creating that minivan look. At the sides, a familiar handle operates the electronically actuating sliding doors. 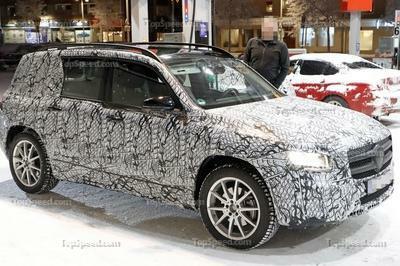 The main support track for the doors could be hidden within the interior door panel. With the door closed, the interior panel would look normal, but when opened, a narrow section of the panel would arch open, revealing a track mechanism that runs along a hinge hidden in the C-pillar. It’s far-fetched, sure, but so are the Falcon Wing doors. Note: Tesla Model X pictured here. Nothing short of Tesla’s high-class interior should be expected. Drivers will find it similar to the Model X thanks to its fully digital gauge cluster and massive infotainment screen. Controls for nearly everything will reside in the tablet, just like previous Tesla products. High-tech features like Autopilot will be present, as well. Seating arrangements will allow for seven passengers in a two + two + three configuration. The center captains chairs will move fore and aft, allowing for extra leg room in the third row bench. Because the third row will seat three, the Tesla Minivan will need to be slightly wider than the Model X, whose rearmost bench only seats two. This differentiation in seating arrangements will help set the Minivan apart from the Model X. it will also allow for more interior volume. That’s especially true for the center console between the front passengers. Now mom has a place to store her massive purse. Expect other innovations like Honda and Chrysler’s vacuum cleaner, numerous cup holders and storage compartments, and an entertainment system for rear seat passengers. Being a Tesla, this minivan will obviously be fully electric. It will also come in a variety of battery sizes. We don’t expect Tesla to offer a P90D version, however, as minivans aren’t meant to be fast. So considering that, the minivan would likely offer the 60D, 75D, and 90D versions, similar (you guessed it) to the Model X. The base 60D will be the affordable entry-level model that most soccer moms will lust for. This powertrain offers 200 miles of range in the Model X, along with a six-second sprint to 60 mph and a top speed of 130 mph. Those are very respectable numbers for a minivan. Opt for the 75D and the range extends to 237 miles, while performance stats stay the same. Those seeking more power or a longer range will love the 90D. It provides 257 miles of all-electric driving and a 0-to-60 mph sprint time of 4.8 seconds. That’s far beyond any current minivan’s stats. All-wheel drive will come as standard equipment, making the Tesla a good choice for northern states. Tesla would likely position its minivan between the Model 3 and Model S, so expect the base 60D to start around $45,000. Choosing the 75D would cost around $53,000 and the high-spec 90D would cost roughly $68,000. 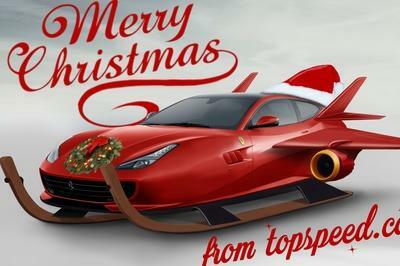 Adding options like Autopilot, the Premium Package, Smart Air Suspension Package, Subzero Weather Package, Ultra High Fidelity Sound Package, and Towing Package would up the prices. 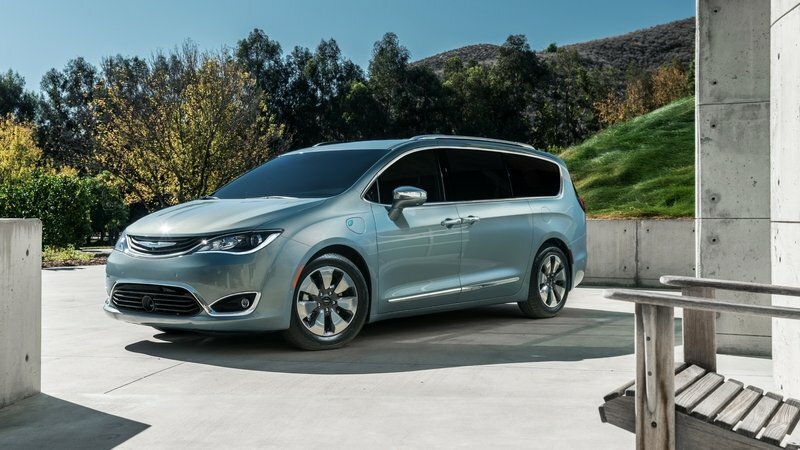 Chrysler is redefining the minivan segment for the 2017 model year with its introduction of the Pacifica Hybrid – the first-ever hybrid minivan. Based on the new-for-2016 Pacifica minivan, this plug-in hybrid offers a more efficient alternative while still allowing parent to haul their brood. It comes powered by a similar 3.6-liter Pentastar V-6 as the standard Pacifica, but incorporates an Atkinson combustion cycle a cooled exhaust gas recirculation system for better efficiency. Electric power from a 16 kW Lithium-Ion battery pack powers two electric motors incorporated within the transmission. Its all-electric range is only 30 miles, but that’s plenty for most around-town runs. When the battery is depleted, the V-6 takes over. With a Level 2 Charger, the batteries can be fully recharged in only two hours. Chrysler estimated the Pacifica Hybrid will achieve 80 MPGe in the city. Prices are estimated to start around $35,000. The idea of a Tesla Minivan might not be too far-fetched when considering all the advantages a minivan-style platform brings. Combining this extra cargo and passenger room with the electric drivetrain and AWD borrowed from he Model X, and the minivan segment might get a sudden boost in popularity. Of course, Tesla has not announced any official plans to build such a vehicle – let alone even the first clue it’s considering this type of project. The minivan segment isn’t the hottest selling these days, after all, so steering clear and concentrating on crossovers and other vehicles would surely be the wisest choice Elon Musk could make.